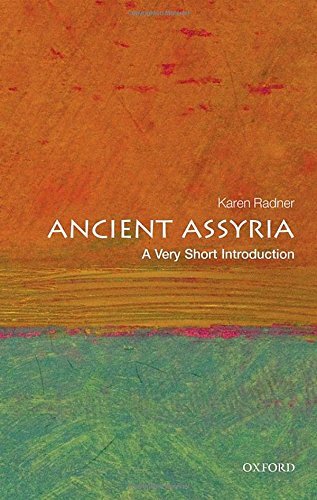 Ancient Assyria: A Very Short Introduction provides an incredibly succinct and valuable introduction to ancient Assyria. At 112 pages of readable content, it is easily accessible to the general public, with not too many technical terms or too much theory. For the most part, Radner focuses on the social realities through close examination of tangible figures. Chapter One sets the stage with a broad overview of the history of ancient Assyria, followed by coverage of the important locations through Assyrian history (Chapter Two). Chapters Three through Five cover the Assyrians in their homeland, abroad, and foreigners in Assyria. Finally, Chapter Six briefly examines the tools by which Assyria became a world power. As a brief, introductory book, there are several things to commend. First of all, Radner writes in a very accessible way. In fact, for the majority of the book it is as if I am reading a story, not just a textbook about history. Thus, it is invigorating and replenishing, helping the reader to see how real people behaved and interacted in real, historical situations. Additionally, Radner’s focus on the real people rather than the mundane history helps the reader to visualize history. As any historian or teacher knows, there is a huge difference between visualized history and textbook history, the former being far more exciting and inviting. Finally, beyond telling the real people of history in ancient Assyria, her ability to incorporate the history of archaeological discoveries in tandem with the history of ancient Assyria is valuable because it helps the reader to grasp how we know what we know. And, like she presents real people of history as a story, she presents real archaeologists of history as a story. At $11.95 from the publisher, it is inexpensive and an excellent addition to any high school history course. For personal reading, it is just as excellent. And in a field oftentimes filled with confusing terminology and complex ideas, Radner’s contribution is invaluable for the way it simplifies and engages the reader in an adventure. I highly recommend this book to anybody looking for an introduction into ancient Assyria. Radner, Karen. "Ancient Assyria: A Very Short Introduction." Ancient History Encyclopedia. Last modified April 27, 2016. https://www.ancient.eu/review/130/. Radner, Karen. "Ancient Assyria: A Very Short Introduction." Ancient History Encyclopedia. Ancient History Encyclopedia, 27 Apr 2016. Web. 24 Apr 2019.